The goal of this project is to build a very small computer keyboard for wearable electronics, electronic conference badges, to play Fortnite on a portable gaming rig, and as a very small USB keyboard. This has been done before. The 2018 Hackaday Belgrade Conference Badge used 55 standard tact switches arranged in a keyboard layout. Another project on Hackaday.io, the mini (Pi)QWERTY USB keyboard, also used several dozen standard tact switches arranged in a keyboard layout for user input. However, there are shortcomings with these devices. The PiMiniQWERTY keyboard is the current state of the art in homemade, miniature keyboards. Firstly, standard 4 mm tact switches are fairly expensive. This is not a problem when you’re only using a handful in a project, but if you’re using sixty or seventy switches per device, those costs add up. The cheapest tact switches I have found come in at about $70 USD per reel of 4000, or about two cents per switch. Multiplied by 70, this is $1.25 USD per device, just on switches. It is conceivable that switches could cost more than the microcontroller in a project. Secondly, tact switches require assembly. The failure rate of a pick and place machine might be very low, but if you’re picking and placing dozens of switches per board, the failure rate will be higher than if there were one monolithic device. Compared to SMD resistors and caps, tact switches are big and chonky, increasing the placement failure rate. Also, since picking and placing switches takes time, you’ll end up paying more for assembling switches versus using one self-contained assembly. This pushes the price of standard tact switches higher. Finally, and this is purely vanity, tact switches have no labeling. If you’re going to build a keyboard out of 4 mm tact switches, you’ll also need to put labels on the silkscreen of your PCB. The Hackaday Belgrade Conference Badge did this sufficiently well, and the mini (Pi)QWERTY did this spectacularly by using two PCBs, one for the electronics, and another for the labeling. It may very well be possible that tact switch keyboards could be labeled through either screen printing or pad printing, but the surface area is already very small; there’s not much room for labeling anyway. A variety of silicone keypads are available on TaoBao and AliExpress. The companies selling these keypads will also make custom keypads. There are many advantages to using silicone keypads. First, nearly all of them use labeling on the buttons. Second, you are not limited to small 4 mm diameter buttons as you are with tact switches. These buttons can be any size and any shape you can imagine. Assembly is easy; to use a silicone keypad with a printed circuit board, you need only place the keypad onto a PCB; everything else is taken care of. Finally, a silicone keypad simply looks cooler than any array of tact switches ever could. So why aren’t people using them? The reason is mostly cost, but there’s also a fair bit of engineering that goes into silicone keypads. Before digging into the design of silicone keypads, I should discuss the various different designs of small keyboards and keypads. The first is Metal Dome keypads, or membrane keypads. As far as popular home computers of the 1980s, the ZX Spectrum or the Atari 400 (the version with the crappy keyboard) are the best examples of tactile membrane switches. Elsewhere in your home, your microwave probably has one of these keypads. These keypads arrange buttons in a matrix. The circuit tracing out this matrix consists of conductive ink drawn on two sheets of polyester. A stainless steel dome is placed over each node (under each key) in the keypad matrix. Pushing the button down collapses the dome, making a circuit between the two layers of polyester. The best pictures you’ll find of a tactile membrane keypad are from one of my projects. Tactile membrane switches do not care how the metal dome is pressed down. The simplest solution to putting buttons and letters on top of the membrane is simply a graphic overlay. A piece of screen printed plastic can be glued down to the array of tactile membrane switches. This is how the keypad in the Speak N Spell and the Big Trak were done. This is how you make a three-year-old-with-Peanut-Butter-proof keyboard. Alternatively, tactile membrane keyboards don’t require hard plastic buttons. You can use soft, silicone buttons above a tactile membrane keyboard, like the ZX Spectrum. Instead of hard, plastic squares like my Metal Dome keyboard, the Speccy used a monolithic sheet of silicone buttons. The ZX Spectrum used silicone buttons in its keyboard, but it was still a membrane keyboard. There’s no difference between a metal dome being pressed down by a sheet of screen printed plastic or a silicone square. The other type of keypad — and the type I’ve built for this article — is a silicone keyboard, or a ‘chicklet’ keyboard, or to mechanical keyboard enthusiasts, a rubber dome keyboard. The silicone keyboard uses injection-molded silicone buttons pressing against contacts. In the silicone keyboard, the carbon contact (a ‘pill’) is molded into the silicone button, and the contacts for the keyboard matrix are constructed with traces on a printed circuit board. The contacts can be integrated into the PCB (ENIG gold plating is recommended) or printed on with conductive ink. In either case, the keypad consists of a circuit board, a silicone keypad with conductive contacts underneath each button, little conductive carbon contacts in each button, and a bezel to clamp the silicone to the circuit board. In deciding between a membrane or silicone keypad, there are a few items to consider, many of which tip the balance in favor of a membrane keypad. 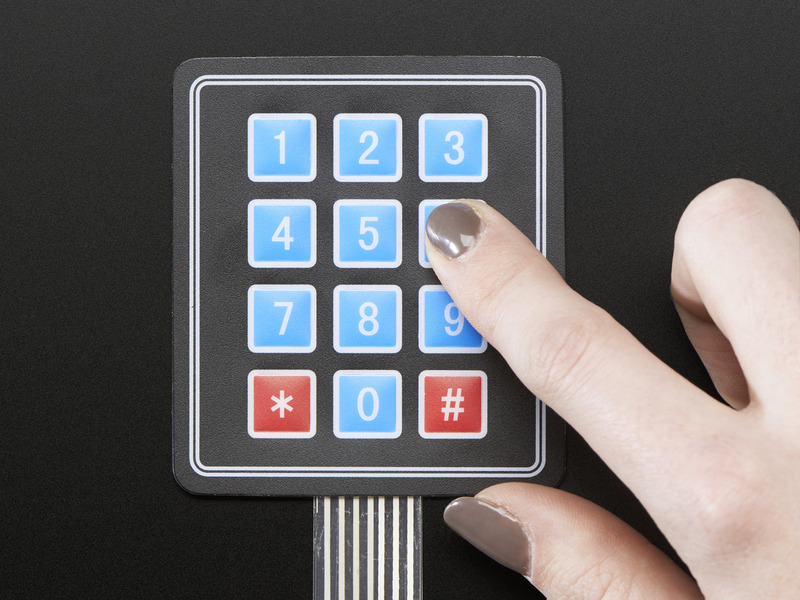 While silicone keypads can be made with multiple colors of button, the graphics on a membrane keypad are effectively printed; a membrane keyboard can have any graphic, in any color. Membrane keypads are inherently cheaper, because they don’t need an injection mold. 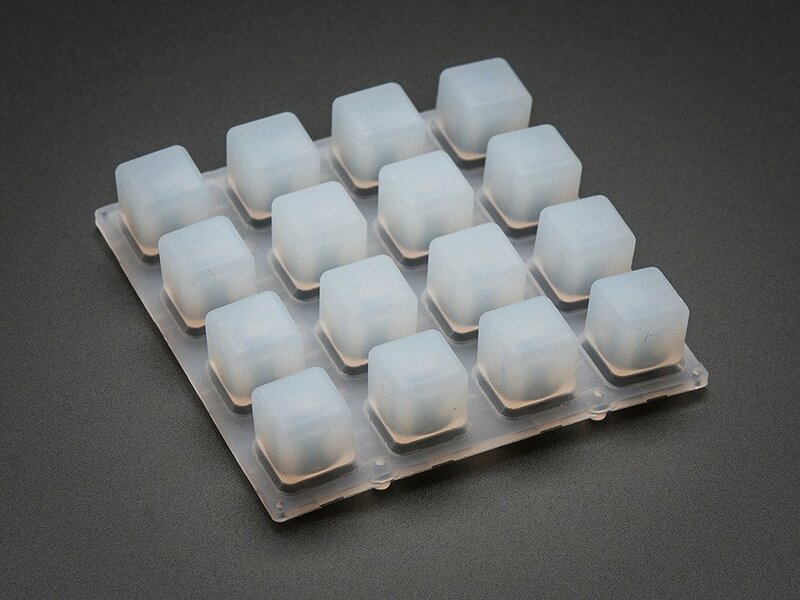 Silicone keyboards require a bezel or fascia to contain the monolithic block of silicone buttons, and this means the added cost of a second mold. Between the two, the only thing a silicone keypad has going for it is the feel. If you’ve ever tried to use an Atari 400, you’ll agree: silicone keyboards are much better to type on. They also have a bit more panache than a membrane switch. To date, I’m not aware of any low-volume usage of customized silicone keypad. That’s not to say they don’t exist in the DIY community, they very much do: Adafruit sells a 4×4 grid of silicone buttons (Sparkfun has the same thing), and similar silicone buttons can be purchased on AliExpress and eBay. Yes, Sparkfun and Adafruit put some engineering time into the design of the PCBs, but the raw buttons are most likely manufactured in some factory in a far-off land. This isn’t a customized silicone keypad; this is a standard, off-the-shelf keypad used for customized projects. These specific silicone buttons have been used to great effect, with a Monome clone, a step sequencer, and a MIDI device. This is what a grid of underlit silicone buttons were designed for, after all: they make great MIDI controllers. But because these buttons are unlabeled, they’re not much good for anything else. These project using 4×4 silicone keypads are, to the best of my knowledge, the only use of silicone buttons in any sort of Maker / DIY / amateur engineering. That’s not to say people aren’t trying. Several people in proper engineering forums are looking at silicone keypads, and a few are experimenting with their own aluminum molds, but to date no one has pulled the trigger. [Dave Jones] has rejected silicone keypads for the uSupply project, instead going with a custom membrane switch. So, what goes into making a silicone keypad? Ultimately, you’re designing a steel or aluminum mold. This mold goes into an injection molding machine where it’s filled with carbon pills, hot silicone is sent in, that silicone is vulcanized, and the part is removed. Further processing can be done to the key cap, such as laser etching the labels, silk screening the labels, and putting a hard epoxy coating onto the key caps. The design of a silicone keypad is the design of an injection mold, but the basic components are actually pretty simple. The example below — a single key silicone keypad — was made in a few minutes with Fusion360. The outside structure of this key pad is defined by the key itself and a layer of silicone serving as a base. On the corners of this base are four bosses, meant to fit into the PCB. These bosses are for alignment, and so the silicone key pad doesn’t slide around. The interior structure of the keypad is defined by a large carbon pill, or the actual contact that will press up against the electrical contacts on the PCB. This is the interior of the key pad I designed, and apart from more keys and more complexity, it’s still the same basic shape as the example above. Notice there are gaps on the underside of the key pad to allow air to pass through to each key. These are fart holes. If you don’t put those in, your keypad will fart. A cutaway view of a silicone button. The black textured part is the carbon ‘pill’, which serves as a bridge between two contacts on a PCB. The profile dimensions of the keyboard I designed. Measurements are in millimeters. 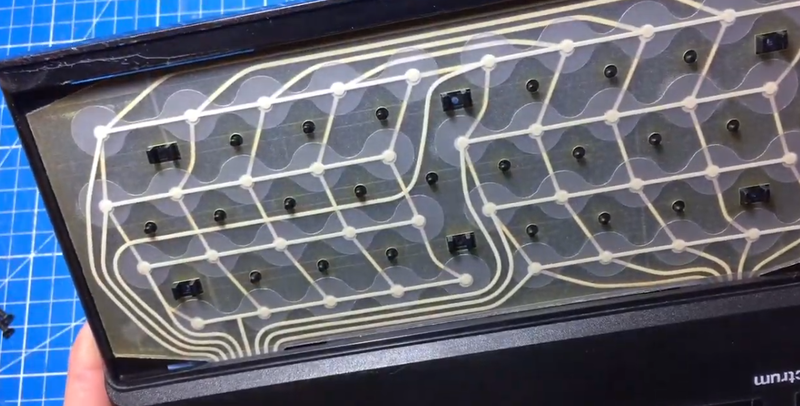 With the design of the keyboard complete and the files sent off to a silicone keypad factory to make a mold and produce a few samples, it was time to create the PCB. In my research, the design of the PCB contacts for a silicone keypad is not critical at all. The only thing that matters is that there are two traces, connected to opposite sides of a keyboard matrix, and these traces should be close together. ENIG, or gold plated finish is recommended. 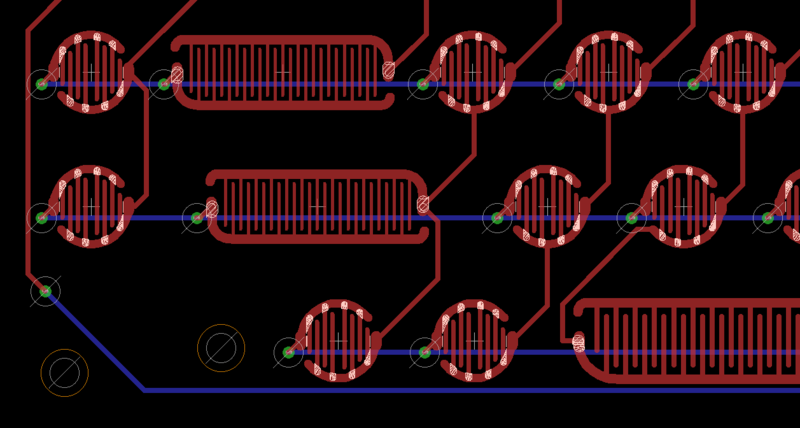 Manufacturing limitations also come into play; the ‘standard’ minimum width of trace and space is 6 or 8 mil, and I designed this PCB with 10 mil trace and space separation for each contact. This model was sent off to Shapeways, and the entire thing assembled. The firmware running on the Teensy just uses the standard Keypad library and presents itself to a computer as a USB HID device. This is a custom-made silicone keyboard, in exactly the shape I want it. It’s not the final build, because the USB keyboard is just a proof-of-concept to test the silicone keypad, but it does indeed work. Economically, this doesn’t make sense unless you’re building 10,000. I’m going to be completely open with how much this project cost. These prices have a sample size of one; I’ve only talked to one silicone keyboard manufacturer, and I’ve only gotten a quote on one design. However, just because of how competitive the market is, I expect these prices to be representative of the average cost of custom silicone keypads. The total cost for a handful of samples is $2,877. This is just the price of the mold and having an engineer look over my CAD files. Three thousand dollars gets me ten keypads. But once the design and tooling is done, the factory responsible for this can churn out keypads. The quote per piece after this ranges from $1.30 USD for 1,000 units, to $0.79 USD for 5,000 units. So all up, one thousand keyboards will cost me $4,177, or just over $4.18 USD/unit. Five thousand keyboards will cost me $6,827, or $1.36 USD/unit. This last price — under $1.50 per unit — makes this a viable technology for anyone doing small-scale manufacturing. We know silicone keypads work for large manufacturers; Samsung is selling millions of TVs, and all of them come with the same remote control. The question of making custom silicone keypads for what are effectively DIY project has always been open. There are no small-scale projects that use this technology, and therefore no one to ask if custom silicone switches make sense. I’m here to tell you that it does, provided you’re making a thousand or so units. At around five thousand, the cost of your silicone keypad and associated plastic bezel might be below the cost of your microcontroller. All the source for this project is available on the GitHub. Today, Nvidia released their next generation of small but powerful modules for embedded AI. It’s the Nvidia Jetson Nano, and it’s smaller, cheaper, and more maker-friendly than anything they’ve put out before. Follow this train of thought: cars have sensors, cars are in frequent use over large areas, cars are the ultimate distributed sensor network for weather conditions. “It wouldn’t happen that way in real life.” One of the most annoying habits of people really into the “sci” of sci-fi is nitpicking scientific inaccuracies in movies. The truth is, some things just make movies better, even if they are wrong. In 1899, you might have been forgiven for thinking the automobile was only a rich-man’s toy. A horseless carriage was for flat garden pathways. The auto was far less reliable than a horse. This was new technology, and rich people are always into their gadgets, but the automobile is a technology that isn’t going to go anywhere. The roads are too terrible, they don’t have the range of a horse, and the world just isn’t set up for mechanized machines rolling everywhere. On January 3rd, 2009, the Genesis Block was created. This was the first entry on the Bitcoin blockchain. Because of the nature of Bitcoin, all transactions lead back to this block. This is where Bitcoin began, almost exactly ten years ago. The Genesis Block was created by Satoshi, a person or persons we know nothing about. In the decade since, we’ve seen the astonishing rise and meteoric descent of Bitcoin, and then it happened again after the bubble was re-inflated. Did you read all 3000+ articles published on Hackaday this year? We did. And to help catch you up, we preset the Hackaday 2018 Year in Review podcast! Why is Continuous Glucose Monitoring So Hard? Everyone starts their day with a routine, and like most people these days, mine starts by checking my phone. But where most people look for the weather update, local traffic, or even check Twitter or Facebook, I use my phone to peer an inch inside my daughter’s abdomen. There, a tiny electrochemical sensor continuously samples the fluid between her cells, measuring the concentration of glucose so that we can control the amount of insulin she’s receiving through her insulin pump. Playgrounds were the comment sections of their day. Every weekday from exactly 1:17 PM until 1:43 PM there were swings to be swung, rumors to be spread, and debates to be settled by whomever was the loudest (some things never change). Allegiances were formed and battle lines were drawn based solely on what video game console you supported. It was this playground system that perpetuated the urban myths of the time. Open Source software is always trustworthy, right? [Bertus] broke a story about a malicious Python package called “Colourama”. When used, it secretly installs a VBscript that watches the system clipboard for a Bitcoin address, and replaces that address with a hardcoded one. Essentially this plugin attempts to redirects Bitcoin payments to whoever wrote the “colourama” library. Science fiction is usually couched in fact, and it’s fun to look at an iconic computer like HAL 9000 and trace the origins of this artificial intelligence gone wrong. You might be surprised to find that you can trace HAL’s origins to a computer built for the US Army in 1952. By the early 20th century, naval warfare was undergoing drastic technological changes. Ships were getting better and faster engines and were being outfitted with wireless communications, while naval aviation was coming into its own. The most dramatic changes were taking place below the surface of the ocean, though, as brave men stuffed themselves into steel tubes designed to sink and, usually, surface, and to attack by stealth and cunning rather than brute force. The submarine was becoming a major part of the world’s navies, albeit a feared and hated one. Sometimes you start something simple and then it just leads to a chain reaction of things. I wanted to write a post about doing state machines in Verilog and target the Lattice iCEstick board that we often use for quick FPGA projects. That led to a small problem: how do you show what’s going on inside? In this series of posts, we’ll look at building a logic analyzer into an FPGA to help debug itself, instantiating memory, and — finally — state machines. When current flows through a conductor it becomes an inductor, when there is an inductor there is an electromagnetic field (EM). This can cause a variety of issues during PCB layout if you don’t plan properly, and sometimes we get burned even when we think we have planned for unwanted inductance and the effects that come with them. I recently saw Apollo 13 again — this time with the score played live by the Houston Symphony. What a crazy coincidence that thirteen has long been considered an unlucky number and that Apollo 13 would be the one we almost lost. However, Apollo 12 almost became a disaster which — after the ordeal with flight 13 — was largely forgotten. If you have your ear even slightly to the ground of the software community, you’ll have heard of Docker. Having recently enjoyed a tremendous rise in popularity, it continues to attract users at a rapid pace, including many global firms whose infrastructure depends on it. Part of Docker’s rise to fame can be attributed to its users becoming instant fans with evangelical tendencies. But what’s behind the popularity, and how does it work? Let’s go through a conceptual introduction and then explore Docker with a bit of hands-on playing around. Decorators are most commonly used with the @decorator syntax. You may have seen Python that looks something like these examples. Carnival games are simple to pick up, designed to provide a little bit of entertainment in exchange for your game ticket. Given that the main point is just to have some silly fun with your friends, most game vendors have little reason to innovate. But we are people who play with microcontrollers and gratuitous LEDs. We look at these games and imagine bringing them into the 21st century. Well, there’s good news: the people of Two Bit Circus have been working along these lines, and they’re getting ready to invite the whole world to come and play with them. When planning a trip by car these days, it’s pretty much standard practice to spin up an image of your destination in Google Maps and get an idea of what you’re in for when you get there. What kind of parking do they have? Are the streets narrow or twisty? Will I be able to drive right up, or will I be walking a bit when I get there? It’s good to know what’s waiting for you, especially if you’re headed someplace you’ve never been before. The Kepler spacecraft is in the final moments of its life. NASA isn’t quite sure when they’ll say their last goodbye to the space telescope which has confirmed the existence of thousands of exoplanets since its launch in 2009, but most estimates give it a few months at best. The prognosis is simple: she’s out of gas. Without propellant for its thrusters, Kepler can’t orient itself, and that means it can’t point its antenna to Earth to communicate. The AND!XOR team have somehow managed to outdo themselves once again this year. Their newest unofficial hardware badge for DEF CON 26 just arrived. It’s a delightful creation in hardware, software, and the interactive challenges built into both. In families with three kids, the middle child always seems to get the short end of the stick. The first child gets all the attention for reaching every milestone first, and the third child will forever be the baby of the family, and the middle child gets lost in-between. Something similar happened with the U.S. manned space program in the 60s. The Mercury program got massive attention when America finally got their efforts safely off the ground, and Apollo naturally seized all the attention by making good on President Kennedy’s promise to land a man on the moon. Believe it or not, counting is not special. Quite a few animals have figured it out over the years. Tiny honeybees compare what is less and what is more, and their brains are smaller than a pinky nail. They even understand the concept of zero, which — as anyone who has had to teach a toddler knows — is rather difficult to grasp. No, counting is not special, but how we count is. Putting Crimpers to the Test: How Good Are Our Crimp Tools? Almost every project of mine from the last quarter century, if it has contained any wiring, has featured somewhere at least one crimp connector. There are a multiplicity of different types of crimp, but in this case I am referring to the ubiquitous variety with a red, blue, or yellow coloured plastic sleeve denoting the wire size they are designed for. They provide a physically robust and electrically sound connection that is resistant to wire fatigue due to vibration, and that can carry hefty currents at high voltages without any problems. Over the last few years, the art and artistry of printed circuit boards has moved from business cards to the most desirable of all disposable electronics. I speak, of course, of badgelife. This is the community built on creating and distributing independent electronic conference badges at the various tech and security conferences around the globe. We tend to think of electricity as part of the modern world. However, Thales of Mietus recorded information about static electricity around 585 BC. This Greek philosopher found that rubbing amber with fur would cause the amber to attract lightweight objects like feathers. Interestingly enough, a few hundred years later, the aeolipile — a crude steam engine sometimes called Hero’s engine — appeared. If the ancients had put the two ideas together, they could have invented the topic of this post: electrostatic generators. As far as we know, they didn’t. You say to yourself, “Self, I want, nay, need a lathe”. Being a good little trooper, you then did all your research, having chosen Import or American, Imperial or Metric, and all your feed options and such. You then pulled the trigger and the machine is en route to your shop. Now what? This past semester I added research to my already full schedule of math and engineering classes, as any masochistic student eagerly would. Packed schedule aside, how do you pass up the chance to work on implementing 360° virtual teleportation to anywhere in the world, in real-time. Yes, it is indeed the same concept as the cult worshipped Star Trek transporter, minus the ability to physically be at the location. Perhaps we can add a, “beam me up, Scotty” command when shutting down. Have you ever noticed how “one size fits all” often means “one size poorly fits all”? This became especially clear to me when I started using a compression sleeve on my arm. Like any hacker, this seemed like something I could fix, so I gave it a shot. Boy, did I learn a lot in the process. Recently, we covered how to use the Etherscan API to query data (a wallet balance) from the Ethereum blockchain with NodeMCU. It’s a very useful method for retrieving information from a blockchain on embedded systems where storage and memory are an issue. While robots have been making our lives easier and our assembly lines more efficient for over half a century now, we haven’t quite cracked a Jetsons-like general purpose robot yet. Sure, Boston Dynamics and MIT have some humanoid robots that are fun to kick and knock over, but they’re far from building a world-ending Terminator automaton. Someone who decides to build a house faces a daunting task. It’s hard enough to act as the general contractor for someone else, but when you decide to build your own house, as my parents did in the early 1970s, it’s even tougher. There are a million decisions to make in an information-poor and rapidly changing environment, and one wrong step can literally cast in stone something you’ll have to live with forever. Add in the shoestring budget that my folks had to work with, and it’s a wonder they were able to succeed as well as they did. On April 2nd, 2018 a Falcon 9 rocketed skywards towards the International Space Station. The launch itself went off without a hitch, and the Dragon spacecraft delivered its payload of supplies and spare parts. But alongside the usual deliveries, CRS-14 brought a particularly interesting experiment to the International Space Station. Building a Portable Solar-Powered Spot Welder: Nearly Practical! Last time, we covered storing and charging a 3000 Farad supercapacitor to build a solar-powered, portable spot welder. Since then, I’ve made some improvements to the charging circuit and gotten it running. To recap, the charger uses a DC-DC buck converter to convert a range of DC voltages down to 2.6 V. It can supply a maximum of 5 A though, and the supercapacitor will draw more than that if allowed to. While the Raspberry Pi’s birthday (and the traditional release date for the newest and best Pi) was a few weeks ago, Pi Day is a fitting enough date for the introduction of the best Pi to date. The Raspberry Pi 3 Model B+ is the latest from the Raspberry Pi foundation. It’s faster, it has better networking, and most interestingly, the Pi 3 Model B+ comes with modular compliance certification, allowing anyone to put the Pi into a product with vastly reduced compliance testing. It’s fair to say that software-defined radio represents the most significant advance in affordable radio equipment that we have seen over the last decade or so. Moving signal processing from purpose-built analogue hardware into the realm of software has opened up so many exciting possibilities in terms of what can be done both with more traditional modes of radio communication and with newer ones made possible only by the new technology.